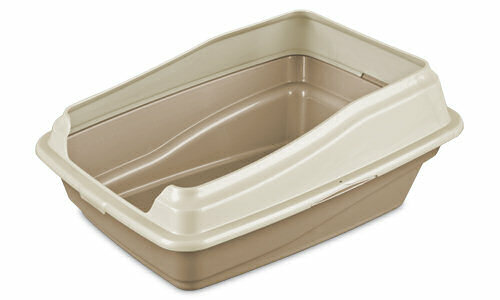 The Framed Cat Litter Pan includes a snap-on frame, which adds height and contains litter scatter. It is a good option for cats preferring an open pan. Its sleek appearance and color makes it easy to blend in with home decor and has a stylish durable design. The reinforced rim provides added strength and a comfortable surface for lifting, carrying and emptying. The sides of the litter pan are high enough to contain litter with a lower front for easier cat access. The polished finish is easy to clean. The overall dimensions of this item are 18 7/8" L x 15 1/4" W x 8 1/8" H.
Overall Assembled Size: 18 7/8" x 15 1/4" x 8 1/8"
Framed Cat Litter Pan is rated 5.0 out of 5 by 7. Rated 5 out of 5 by Jinny from Durable and Tidy I have 2 cats that share the same litter box. This is large enough to accommodate both of them, and it keeps the litter from spilling out the sides. Rated 5 out of 5 by Sandy Ferguson from Has Prissy's stamp of approval! Fits in small semi-enclosed area with little headroom. Prevents litter from tracking elsewhere. 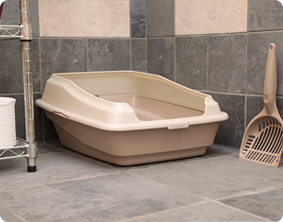 A wonderful compromise between bulky cat litter pans with hoods and regular flat cat litter trays. Rated 5 out of 5 by Val from Does what it is supposed to. I like that the opening is a bit lower in the front. Made it easy for our kitten to get in. Rated 5 out of 5 by crooksie from Framed Litter Box I have 4 cats and anyone who owns cats knows how messy they can be with the litter box.The best part about this box is the frame which will help to keep the litter in the box.Most boxes do not have this and the litter goes everywhere with those boxes. Rated 5 out of 5 by prettygentle from Saves The Pet's People from Extra Messes We have one of these littler pans in our bedroom. Before, our cat used to "throw" litter out the sides of the pan when trying to cover up her business. Now, the litter stays inside the pan... except what she drags out on her paws... but that is easier to clean up than big piles of litter on both sides! Our cat doesn't seem to mind that it's not enclosed like the covered litter pans. I do have it tucked away under a stand to give her a little more privacy. Another great advantage of this pan is that you can SEE inside the pan to know if it needs to be scooped sooner rather than later. Now, if they could just design one that the dogs can't get into... I would recommend this product to other pet parents. Rated 5 out of 5 by CindyBear from Really handy item My cats have 2 litter boxes and this is one of them. They prefer this one and I do too. It helps them from spilling the litter all over my bathroom. This box is the one they like to use the best! !